The FBI told Cole that investigators traced the money through five banks and it is out of the country, meaning there is no hope the family will get the money back. "It's everything we had worked for," Cole said. His family’s dream died with a single email. Cole got it last week — a day after speaking with representatives from WFG National Title Insurance Company, the title company he'd been working with. 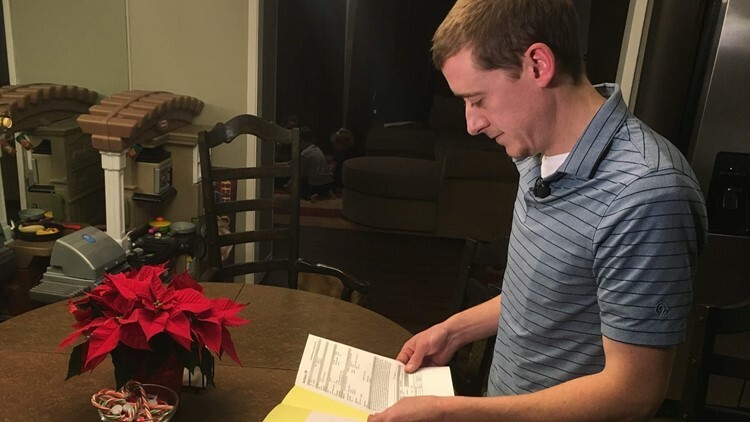 Cole said they told him they'd soon be in touch, with instructions for wiring $123,000 for the down payment on his new home. "The next day, I got an email that looked identical to the ones I'd gotten from everyone [at WFG] I'd been working with for months," Cole said. "It had wiring instructions." Only, the email wasn't from WFG. According to Oregon City police, it appears to have been a sophisticated scam email with directions on wiring the money to criminals. Believing it was a legitimate email, Cole transferred the $123,000 from his Bank of America account. "It went to whoever it was that intercepted our messages," Cole said. In this case, a Chase bank account in Lantana, Florida. Only when WFG employees called Cole on Monday with legitimate wiring instructions did he realize what had happened. "I just essentially ruined my family's life. That’s how I'm feeling," Cole said. "Just under $123,000. More money than I've ever seen in my entire life." Cole filed a police report. He contacted Bank of America, which froze Cole’s account. "I already know. [The crooks] have moved that money," he said. KGW contacted WFG and spoke with Executive Vice President and Chief Compliance Officer Don O'Neill. O’Neill said he believes Cole's e-mail account was compromised, not WFG’s encrypted system. "There is no evidence in our system to suggest someone would have stolen that information from us," O’Neill said. "We've investigated this." O’Neill also admitted WFG has dealt with half a dozen similar wire transfer fraud cases this year. Before wiring money for any reason, O’Neill said it’s important to call the institution you're working with to verify wire transferring directions. "It just blows me away," Cole said. "[Those victims’] money's gone and [WFG] just says, 'Gosh, we're sorry.'" Cole said he can't be sure where the security breach came from, but he doesn't think it was on his end. He pointed to one major difference between legit emails he received from WFG’s Portland branch and the fraudulent email containing money wiring instructions. Cole said the fraudulent email contained names and contact information from WFG’s Beaverton branch, which Cole said he has never worked with. "I don't have any of their email addresses," Cole said. "[The crooks] would not have gotten that from me." The Coles need to be out of their home by Dec. 23 to make way for the new owner, and they're hoping for a miracle between now and then. "We don’t have anywhere to go," Cole said. Many of Cole's coworkers have offered to create a GoFundMe account to help out his family, but he says he does not want to take that route yet. He wants to try and get the money back legitimately and wants to keep the parties he feels are responsible on the hook.